Bajaj Avenger 150 has been the most affordable cruiser bike offered for sale in the Indian market. Excellent performance, good handling capability and better mileage are some of the unique selling points of Bajaj Avenger Street 150. It is designed to ensure great comfort to the riders in their daily commutation. Bajaj Avenger Street 150 features black alloy wheels and gets 17-inch (12-spoke) tyre for the front wheel and 15-inch (9-spoke) tyre for the rear wheel. Various international, as well as Indian tyre brands, offer high-end tyres for the Bajaj Avenger Street 150. To name a few there are MRF, TVS Tyres, CEAT, JK Tyre, Michelin, Ralco, and Pirelli. Tyres for Bajaj Avenger Street 150 are available for purchase, both in tubeless as well as tube type nature at Tyremarket.com. The front tyre size of Bajaj Avenger Street 150 is 90/90-17” 49P and its rear tyre size is 130/90-15” 66P. Both the tyres are installed on the black finished alloy wheels. 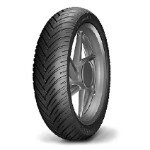 Tyremarket.com offers tyres from the leading brands for your Bajaj Avenger Street 150 at best possible prices. You can shop from the ‘Premium Range Tyres’ and ‘Economy Range Tyres’, as per your budget. The tyre prices fall in the bracket of Rs 1000-2500 approx. On Tyremarket.com, you can also shop the tyres based on their specifications like load index, speed rating, warranty, etc. The iconic looking Bajaj Avenger Street 150 is one of the most competitively priced cruisers in the segment from Bajaj’s stable. The promising features of the Bajaj Avenger Street 150 come in the form of refined engine, attractive color theme, digital trip meter, electric start, halogen headlamp, stylish pillion grab rail, etc. The engine produces 14.54 PS at 9000 rpm and 12.5 Nm at 6500 rpm. The cruiser weighs 148 kg and stretches 2177 mm in length, 801 mm in width and 1070 mm in height. The approximate mileage offered by Bajaj Avenger Street 150 is 45 km/l.